Fright Meter Awards Blog: Interview with 2011 Fright Meter Award winner for Best Supporting Actress, Lin Shaye of "Insidious." Interview with 2011 Fright Meter Award winner for Best Supporting Actress, Lin Shaye of "Insidious." Lin Shaye is making quite a name for herself in the horror community. Even before Insidious achieved massive success this past year, she had already enjoyed widespread acclaim for her performances in 2001 Maniacs, and Dead End for which she won the Fright Meter Award for Best Actress. With her recent Fright Meter Award win for Insidious, Shaye joins the likes of Danielle Harris, Jamie Lee Curtis, Angela Bettis, and Margot Kidder as an actress who has won two or more Fright Meter Awards. And there is no arguing that both her wins are much deserved. In Insidious, her portrayal of no-nonsense psychic investigator Elise Rainer strikes the right balance between stern authority figure and sympathetic, yet frightened support for the Lambert family, who are being terrorized by a malevolent force. Shaye's confident and commanding screen presence allows her to be the bridge between the audience and the supernatural activity that is occurring in the film. Through Shaye, the audience knows when they can relax a bit or when they should grasp the arm of the person sitting next to them. Not since Zelda Rubenstein's portrayal of Tangina Barrons in Poltergeist has portrayal of a psychic investigator been so convincing and entertaining. Fortunately, Shaye was gracious enough to chat with us about Insidious and her past work in the genre. Read below for our interview with this wonderful and extremely talented actress. First, congratulations on your 2011 Fright Meter Award win for Best Supporting Actress for your performance in Insidious and your previous Fright Meter Award win for Best Actress in 2004 for Dead End For those who may be unfamiliar with you, can you tell us a little about yourself? Well....about myself....in a nutshell...and it's a pretty big nutshell...I was born in Detroit, Michigan...My early acting days came from entertaining myself as a 5 years old, by "playing dress up," making up stories and acting out all the characters!!! I never thought about "being an actress" but always loved stories and plays, and finally it dawned on my after finishing college at University of Michigan where I was an Art History major, what I had always loved to do had a name!!! ACTOR! I went on to a graduate degree in Theater Arts at Columbia University, and living in New York City, fround myself working in off, off off Broadway and even Broadway for the 10 years I lived there. I continued to study with Uta Hagan and also became a life-time member of the Actors Studio under the amazing Lee Strasberg. I came to Los Angeles in the late 70's "to meet Jack Nicholson" for a very small role in his film Goin South...and never left! I still love acting and "trying on clothes and making up stories" as much as I ever did! 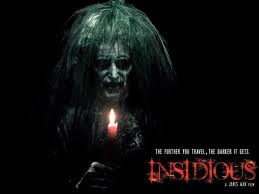 In regards to Insidious, how did you become involved and what made you want to be involved with the film? I met James Wan through the wonderful Tim Sullivan. James was a fan of Dead End and Tim introduced us. James asked me to do a little short called Doggie Heaven...and after that he sent me the script for Insidious. The script and role were fantastic, and so is James. I was flattered and exciting to be working with him on this feature. Did you do anything particular to create your characterization of Elise Rainer? For Elise I worked mostly on her "back story" rather than the paranormal aspect of her. She is the story teller in the film, and it could have ended up being all "explanation" and narrative, and I was looking for a way for the audience to relate to Elise and for Elise to have "private stakes from her life" that made this event so urgent to her. This was not her "normal" paranormal problem to solve...but a personal one. The parts of her life I "made up" and worked on is an "actress secret" and will always remain so! Is it safe to say that Insidious did much better than anticipated by those involved? What about the film do you think made it resonate with so many people? The film "resonated" I believe because it is essentially a "family drama" turned on it's head. Patrick Wilson and Rose Byrne had such great chemistry and are such warn and appealing people as well as actors, I believe the audience was "drawn in" and drawn into their family which made everything that happened even more frightening and upsetting. You felt like you knew and loved this family...and they had "universal problems" as a couple and as a family. Its also brilliantly photographed by John Leonetti...and James is indeed a master of "the scare!" What was it like working with the men responsible for Saw? What was it like on the set with them? Any interesting stories you can share? James and Leigh Whannell are just fantastic. smart, kind and original. They are also terrific "problem solvers" and listen to the other creative people around them with an open mind. Working with them was a true collaboration...they were never afraid to "change" something if it wasn't working, and always took time to LISTEN...to whatever concern you may have. No tempers or disquiet on this set....a really fertile place to work and create. So, do you believe in the supernatural? Do I believe in the supernatural? Absolutely! There are so many things happening in the world and outside of it that are completely unexplainable that it's impossible to say no. We can't ignore your wonderful past work in the genre. You have appeared in 2001 Maniacs and its sequel, the already mentioned Dead End, Chillerama, A Nightmare on Elm Street as well as non-genre films such as There's Something About Mary and Hate Crime. What has been your favorite role/performance, the one you find the most memorable? Kingpin and There's Something About Mary are two of the most memorable...both have long stories, but mostly the Farrelleys were the first directors to cast me because, as they put it, "I was the best actress who came in, not because "I was right for the part!" They really let me fly with my creations, and for an actor, nothing feels more rewarding or better. But...I have loved EVERY project I have ever worked on for different reason...(Dead End also being one of my all time favorites...working with Ray Wise...who is one of my favorite "partner's in crime.".. ).but truly love each and every project I have been lucky enough to do... Tim Sullivan is another fantastic collaborator...we honor and respect each other's creative ideas always, which also makes for a wonderful artistic adventures. So, what's next for you? Any coming projects we can expect to see you in? Yes...lots is brewing...but nothing I can "reveal" right now! I will keep you posted!